In my previous Introduction post, I discussed the viability of making signs, and my own personal experiences over the last 9 months. Feel free to go go back and review if you missed it. Otherwise lets get down to the nuts and bolts of making a sign. 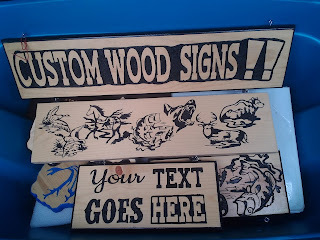 In Part 1 of this tutorial I will be outlining the tools and materials you will need to begin carving wood signs for fun and a little money. I am going to list what I use first, and then some cheaper or different alternatives as well. Tools are the major startup costs associated with making these signs. A trim router is your method of carving into the wood. 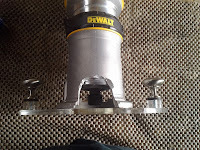 Its a rotary tool like a dremel, but larger. They make larger routers than a trim router, and they make plunge varieties, but a trim router is all you need. If all you have is a full size router already, than you can still use one of those as well. This is your work horse, so it may be worth it to get a dewalt, its currently $112.99 on amazon. However, I've found a cheaper alternative at Harbor Freight for $29.99 The harbor freight option has less power, and may not last as long, but if you want to cut costs early to get in, and then upgrade later this could be an option. Ive found one person online who claims to have had success using it. Since you will be using a trim router, it doesn't come with handles to guide it (large heavier routers do have handles). 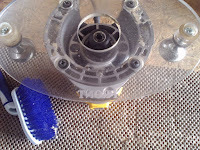 Most routers, including the dewalt, allow you to attach different plastic bases to the bottom with a few screws. You can create your own custom base with acrylic plastic, and attach handles to it. Just counter sink the holes for the screws. The handles can be cabinet handles from lowes. I would recommend making your own if you have the skills. If you opt for the harbor freight router you will have to make your own. 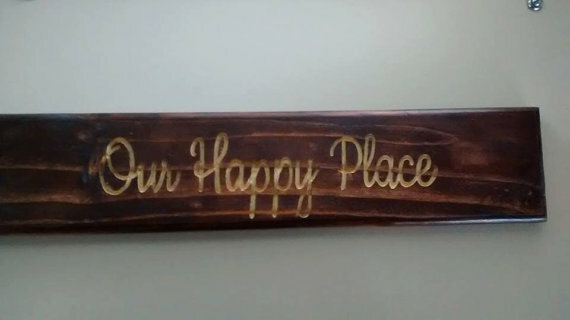 However, if you have a dewalt or porter cable, you can order such a base from Dave's Signs here for $25.00 plus shipping. For $13.13 you can accomplish most of your sign routing with this 60 degree bit, by adjusting the depth on the router you can make thinner or wider lines. However, I also grabbed a thin 11 degree liner bit for $21.60 for doing sharper details (without losing as much depth), and recommend it. There shouldn't be anything you couldn't carve, short of a photograph, with these 2 bits. As time went on I have added a round over bit to put a fancy edge around the signs, and a 90 degree bit for large background removal. I got these more standard router bits out of a cheap set a friend had. 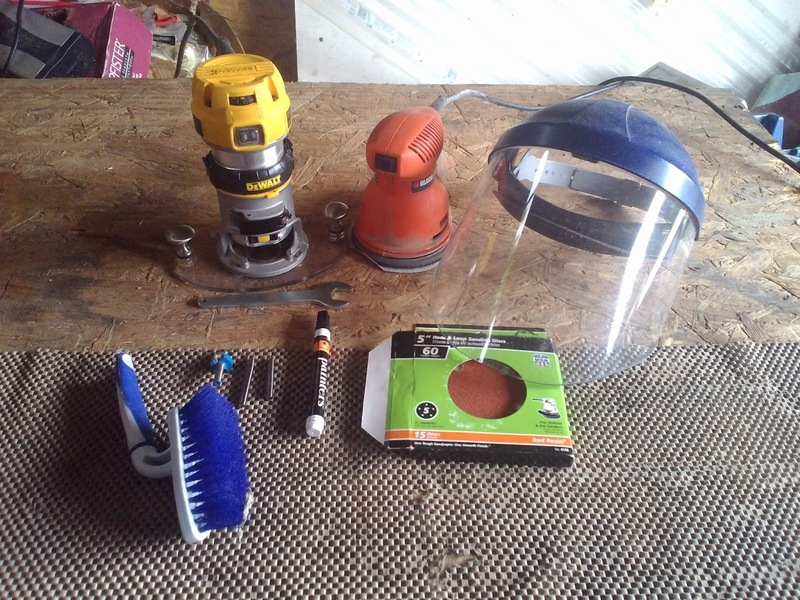 Just about any sander will do however, this was the cheapest I have found, and except for the dust collection bag popping off last month or so it worked fine. If you have a sander use that. A belt sander works too, and I prefer it on larger signs, but you really have to be careful with the pressure you apply and the grit you use. Too much sanding will obliterate your fine details on carvings. 60 grit is as low as I would go on either, though I prefer 80 grit on the belt sander. You should be fine just grabbing some 80 grit to start with. Grab one at lowes or amazon, they're are about the same. JUST GET ONE. You can go goggles with a breathing mask if you have to (i did at first) but a full face shield will make it way easier to see what you are carving. Fog up is a lot less of an issue too. You WILL get a lot of sawdust and chips flying right at your face. One of my favorite upgrades. 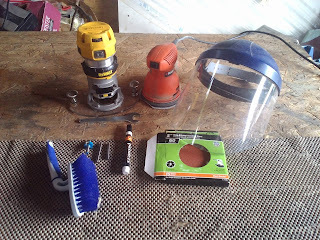 I still use a mask when heavy sanding or in confined space. Hit up the dollar tree or hardware store and get some ear plugs too, routers are some of the highest pitched, loudest power tools, and can damage your hearing in no time. Go to the dollar tree, get a stiff bristled brush. This is used to brush out chips and dust while you are carving that will snag the router or block your vision. I used a sharpie at first, but now i use these acrylic markers instead. Either will work but the painters will match the paint on the sign better. These are used for touching up high spots (more later). If you have these, great. There is a bazillion printer options and prices change a lot, so just shop around. You don't need anything fancy, black and white is fine. Don't get a laser printer, go for an inkjet. This will keep your sign stationary while carving. A roll is 2 bucks at dollar general. These are the consumable items you'll use to make your sign. Most of these can be picked up locally at hardware stores, hunt around for the cheapest prices as they fluctuate. You want to get a solid wood board, no plywood. Surprisingly this is one of the lowest costs you have. I used to get boards from lowes, 1" x 6" x 8' for $8-12 dollars depending on the kind (usually pine or cedar in east coast). You can get 8 one foot signs out of a single board. However, I would recommend something else, go to the lawn and garden area outside and look for fence pickets. These are about 6 feet long, with one end being cut into a fence shape. These cost $1.50 or less a piece! You just have to sand them smooth. Square off the top, then cut them into 1 foot or two foot length signs. Select ones that don't have a lot of warping or cupping, and you want to put em some place to dry to prevent it. 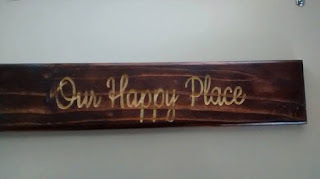 If you need an even cheaper alternative, you can make signs from pallet wood as well, though i found it hard to find boards that are not warped. Some people still like that aesthetic though, here is an example, which i used with a red oak stain. You need some paint for your signs. Since you will be sanding off most of it, and you don't want a bleeding effect, I recommend sticking to either primer, or stencil ink from Marsh. 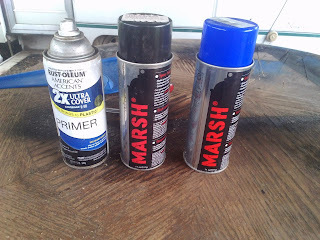 Marsh makes a bunch of colors, its easy to sand off and dries fast like primer. Its availability is spotty however, and costs about a 25 cents more usually than primer, more if paying shipping. You might use cheaper paints, like those at the dollar store, but if it bleeds you could lose carving detail as you sand deeper and deeper to get it out of the wood. I ruined a sign with green paint, it basically stained the wood green it bled so far in. The carving was obliterated and I still never got it out. Black is fine for most signs, it provides a classy, rustic look people like. You can also add color on top if you want, after the finish (more on that later). Some people use something called sanding sealer to prevent bleeding. Ive used it, but cant say that I have observed a difference. YMMV. 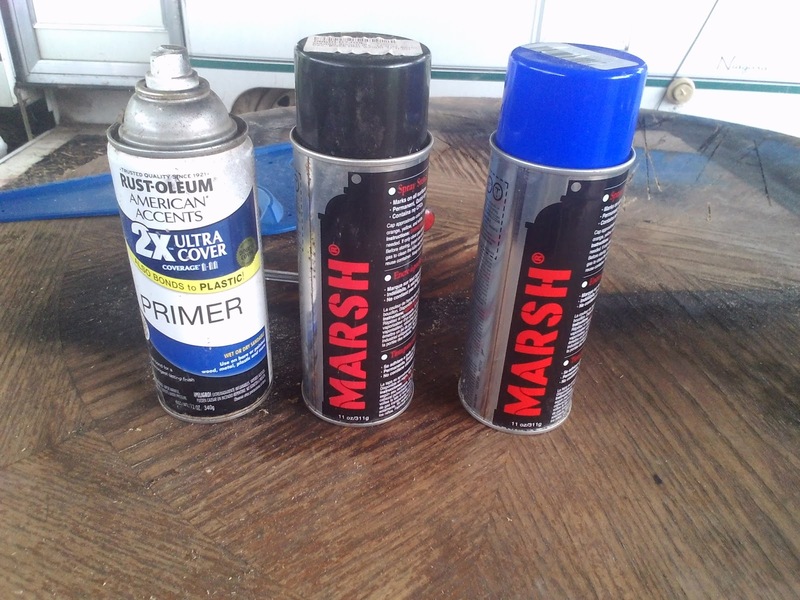 For indoor use, the choice is easy, snag some rustoleum clear for $3.75 or so. It dries super fast and looks great. Make sure it is glossy, not semi or satin. For outdoor you might want something a little more robust, like the helmsman above. The spray can is $10 and its about $16 for the brush on quart. 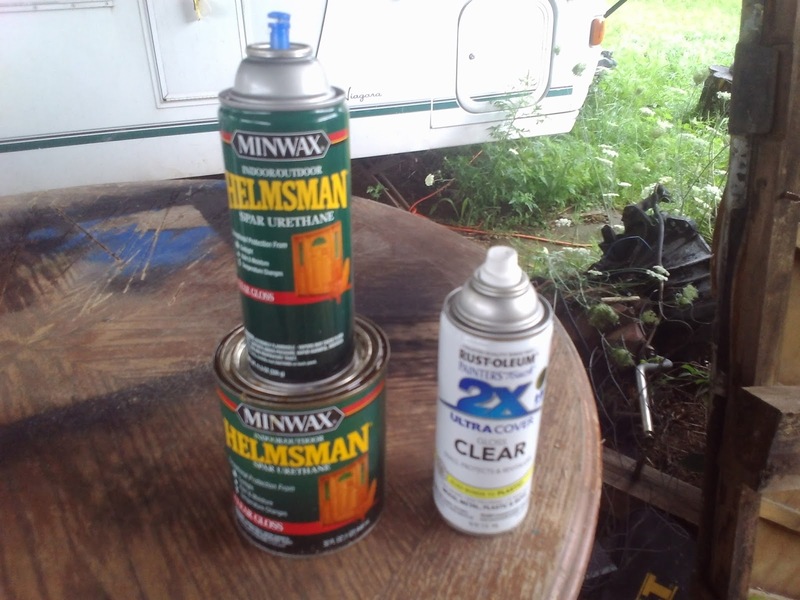 The quart may seem more expensive, but you get a lot more out of it than the spray, so I will use one coat of the spray first to seal the sign, then brush on 3 more layers. Besides the sanding disks or belts for your sander, you will need a piece of 400 grit sand paper to smooth the finish out. Anything over 200 works, but i like 400 grit the best. A pack only costs like 3 bucks, and you can get a lot of use out of it. Im still using the same sheet of sandpaper i started with. You will be printing out your designs and then transferring them to the wood for carving. You can use either to do it, and they both have their advantages and disadvantages. The Freezer paper is wax paper on one side, and regular paper on the other. It creates the crisper transfer, however when you turn it over to press it to the wood you can not see where exactly its going, so alignment is hard. Not a huge factor on smaller signs but annoying. The transparency obviously you can see exactly where you are placing it, so alignment is good, but the transfer is less crisp, and can blur on fine details. Printing in gray instead of black helps this some. If you want to do large signs, go with the transparency. Its what i currently use unless i'm doing extremely fine detail. I might try to post a video showing the difference here. You can buy picture hanging hardware in a kit from dollar general for under 2 bucks, and it includes screw in eye hook and sawtooth style hangers, bunch of em. 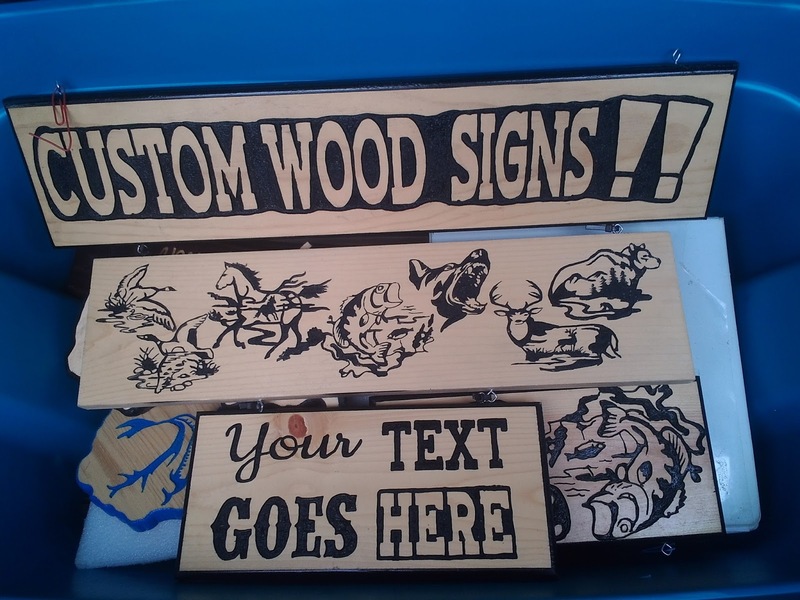 I like to give a sawtooth and 2 eyes to my customers as a bonus with the sign, but do not attach them as they might have other mounting ideas. And thats about it for tools and materials. Lets move onto Part 2: Preparing and Designing your sign.